Swedish Radio reported on 23 June that home furnishings retail giant IKEA in Israel discriminately ships to Israel's illegal settlements but not Palestinian cities in the occupied West Bank. Swedish Radio's correspondent in Israel, Cecilia Udden, explained that she was moving to the Palestinian city of Ramallah in the occupied West Bank and asked the staff at IKEA Israel if her furniture could be delivered there. She reported that behind the store's counter was a huge map of Israel that showed no boundaries for the occupied West Bank, Gaza Strip, or the Syrian Golan Heights. Although IKEA's cost of transport is calculated according to distance, to Udden's surprise, transport to Ramallah was not possible. However, the store did inform her that furniture could be delivered to various Israeli settlements throughout the occupied West Bank. Ove Bring, a professor of international law, explained to Swedish online magazine Stockholm News that IKEA's policies discriminate against Palestinians. In addition, the shipping policies violate the company's code of conduct, which is published on its website. IKEA stated in Udden's report that because it relies on local transport companies for deliveries it is bound by local rules. However, Bring challenged the company's assertion and stated that IKEA must examine whether the transport companies are truly unable to deliver to all customers who request the products. Indeed, when Udden insisted on an answer from the transportation company about why her furniture could not be delivered to Ramallah, she was informed that the Israeli military prohibits the deliveries to customers in Palestinian communities in the occupied West Bank. In its historic 2004 advisory opinion, the International Court of Justice emphasized the illegality of activity that normalizes Israel's illegal settlements in the occupied West Bank. Indeed, Rabbi Abraham Cooper of the Wiesenthal Center -- which is building a Museum of Tolerance on a historic Muslim cemetery in Jerusalem -- told the California-based Jewish weekly J. that the opening of an IKEA store in Israel "will be another chink in the attempts that are still out there to boycott Israel". Ironically, before the opening of an IKEA store in Israel in 2001, the retailer was threatened with boycott by the Wiesenthal Center because the company's founder, Ingvar Kamprad, was a member of the fascist New Swedish Movement in the 1940s. The Wiesenthal Center also suspected IKEA of complying with the Arab League boycott of Israel because it appeared to avoid commercial involvement in Israel despite possible opportunities. In a December 1994 letter to the Wiesenthal Center, IKEA President Anders Moberg stated that IKEA had not participated in the Arab League boycott and that company was in the process of investigating the possibility of opening an IKEA store in Israel. 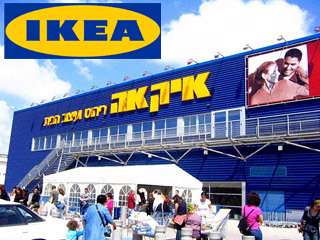 Today IKEA's empire boasts 300 stores in 35 countries, including two stores in Israel; the company intends to open a third store in Haifa in 2012. The IKEA brand survived the revelations of its founder's links to fascism during his youth and the company demonstrated its sensitivity to a possible consumer boycott. In yet another irony, the boycott, divestment and sanctions of Israel movement is already mobilizing in Sweden. At the end of June, the Swedish Dockworkers Union began a week-long blockade of goods to and from Israel. The action by the SDU was in response to a call by Palestinian trade unionists in the context of Israel's three-year blockade of the Gaza Strip and its attack on the Mavi Marmara aid ship on 31 May. In this context, it remains to be seen whether IKEA will rectify the racist policies of its store in Israel before such practices inspire a new consumer boycott threat.